Double the Avios may double the fun. For flights before December 31st, 2019, you can earn double points for your first six round trips, or six one way flights. All you need to do is register here for the UK, or register here for the USA. You must register and book before April 19th. If you have more than six round trips in the booking pipeline and one isn’t going to earn much, consider waiting to register until after that flight, but before April 19th. If you don’t what are you waiting for? Unfortunately, flights you’ve already booked don’t count. Womp, womp to that. You must register for the offer before booking flights, and once you have you’re all set. The double Avios will be added after you fly for, as long as the flights were booked within this promo window. Basically, book before April 19th for flights you actually take up to December 31st. For someone with elite status, especially Gold, this is like another 100% bonus, bringing you a 300% return or better on some fares. 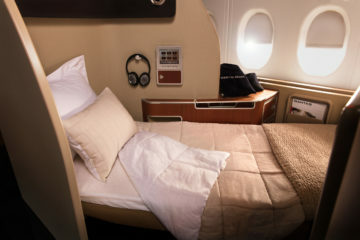 A business class flight between New York and London or vice versa for a BA Gold member would earn at least 22,000 Avios round trip. The bonus applies to base miles only, and not on top of elite bonus or cabin bonuses. For a non elite, it’s a straight up double, for an elite, it’s going to add a nice chunk. I already booked my flight for a couple weeks from now. Sigh. Ah well. Maybe I will be able to plan my follow up trip before the deadline though!! Thanks for the heads up. I registered! Womp womp indeed. The right thing to do would have been to offer this to people who have already shown loyalty to BA by booking flights without the bonus. They Bonvoyed their loyal customers pretty well. I really love the look of the new Club Suite. I think it’s a huge improvement. I can’t wait to try it out and find a fare where I can get double Avios. OMG. So gutted I didn’t get first comment. I love getting first comment on a post. Anyone else? TGIF y’alL! Sorry GBTP, I wish you better luck next time. Wonderful to have such an engaged reader. TGIF indeed. When I grew up, my mom used to let me play with sock puppets, because I had no friends. Now I make friends on the internet. Gib using GBTP sock puppet to talk to himself is his second favorite activity after hunting for hunky men on various apps. From my understanding of the small print the flights must be flown with a BA prefix. In other words you can’t fly AA say LHR-JFK and simply add your BAEC to the booking OR book on BA metal via AA (which on occasion works out cheaper)… You have to book via BA. It might be worth clarifying, as it’s not totally clear the way I read the article.